When the average person thinks of a video game movie, they might recall Final Fantasy VII: Advent Children, Resident Evil, or Mortal Kombat. 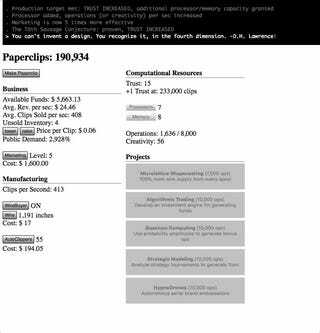 Universal Paperclips, a 2017 web-based game with no graphics or apparent characters, is a pretty odd inspiration for a film. The player first creates one paperclip at a time by clicking on a box, and as they gain more money, they gain access to features that help them finance, market, and finally automate their paperclip factory. Its creator, NYU Game Center professor Frank Lantz, says the player is actually an AI. 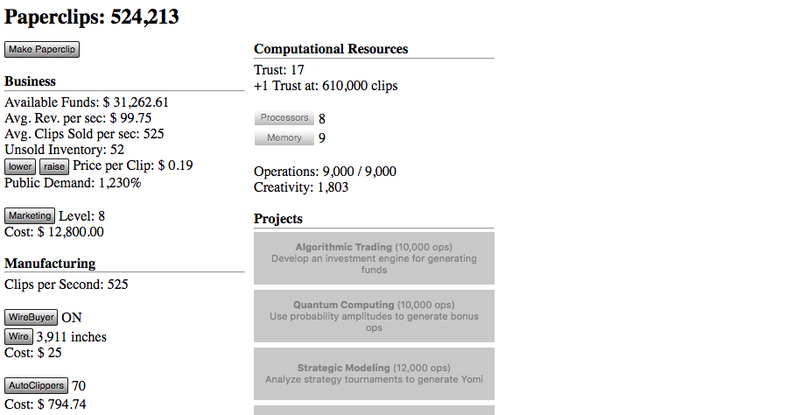 At the end of the game, after the cut-and-dried mechanics slowly give way to more advanced simulations, the AI is finally able to convert the entire universe into paperclips. In 2017, the game went viral. Roldán demurred when asked for a script excerpt but says that it’s nearly finalized and that he’s spoken with some interested producers. It will be exciting to guess what Universal Paperclips might become.